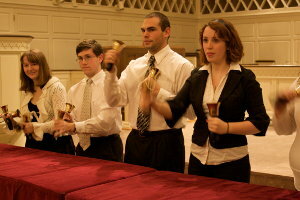 The University of Lynchburg Handbell Ensemble, under the direction of F. Johnson Scott III, and four chamber groups will present “An Evening of Handbells and Chamber Music” on November 10 at 7:30 p.m. in Snidow Chapel. The concert will feature handbell, organ, and chamber works by Ewald, Mozart, Dvorak, Beethoven, and Gershwin. Chamber groups performing include Con Brio Woodwind Quintet, Ars Nova5 Piano Quintet, Snidow Brass Quintet, and 4tet+1 Saxophone Quintet.